Click here to purchase a single issue or subscription to CBeebies Art magazine. 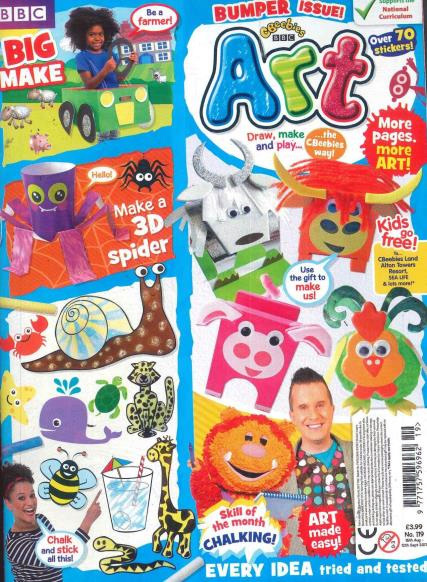 CBeebies Art is a monthly magazine jam packed with everything your child needs to create their own amazing art. The magazine launched in 2009 and acts as the perfect replacement for the much loved but now ceased Art Attack magazine. Aimed at children aged 4 to 6 years old who love to make and create. Let them find their inner Picasso by drawing, cutting, scribbling, folding and sticking until their hearts are content. Every idea is tried and tested with a good mixture of activities for the children on their own and projects that parents can partake in. CBeebies Art is based on areas of learning which support early years development and the National Curriculum. These areas include creating, feeling good, physical development, maths, communication and find out. The latest issue is bursting with lots of amazing art to do! The free gift allows your child to build some 3D farm animals including a highland cow, a pig, a goat and a cockerel. Then pull off the cover to create a farm to play with. Also inside are step-by-step picture guides helping your child to learn how to draw cute creatures. The skill of the month is “Let’s get chalking!” with free chalk and 12 pages of fun, let your child experiment by swirling, blending and smudging to create lots of chalk art. Your child will be able to enjoy drawing with Dipdap and Squiglet, then use lots of stickers to create a colourful picture with Doodle Do. Plus, if you still have time, why not try the “Big Make”, in this month all the information you need to make a farmers tractor. I’m sure with all of these activities you and your child are bound to have endless hours of arty fun!